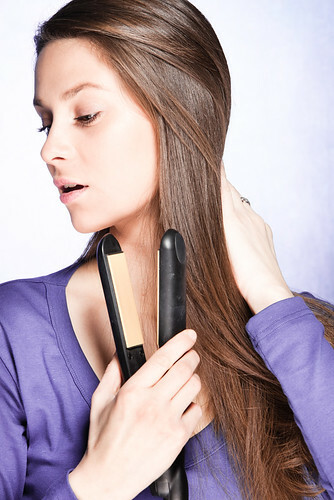 If you use hot tools to style your hair on a regular basis, you may have experienced dry, damaged hair. Though hair loss is not directly linked to heat styling, your curling irons and straighteners may be an incidental culprit in the long-run. Dr. Joel Schlessinger explains how heat styling may play a secondary role in hair damage and loss of volume. The leading causes of hair loss are genetics and hormones, though environmental factors such as poor diet, frequent chemical treatments and heat styling can come into play. Using high temperatures to style hair on a regular basis can cause breakdown in the cuticle, the outermost part of the hair shaft that helps strengthen and protect it. The cuticle acts as the first line of defense against damage, and when it breaks down, the rest of the hair can become weak and dry. Split ends form, and hair may take on a rough, frizzy appearance. Split ends may give the illusion of hair loss, says Dr. Joel Schlessinger. When split ends travel up the hair shaft, hair can break off more easily at the root. Breakage close to the root may give the impression that hair is thinning or falling out, but hair breakage from heat styling is not the same as permanent or temporary hair loss, even if you technically may be losing density. Ceasing heat styling for an extended period of time is often the best solution for repairing damage and restoring hair to its natural luster. You can also help rehabilitate hair by adding a deep conditioning mask like Fekkai PRX Reparatives Intense Fortifying Masque to your routine one to two times a week. It’s important to keep in mind that repairing damaged hair takes time, and you’ll need to be patient to see results. Dr. Joel Schlessinger recommends hair care products from LovelySkin.com. To minimize damage from heat styling, the most important thing you can do is keep it to a minimum. Save your curling irons and straighteners for special occasions only and opt for day-to-day styles that do not require heat. When you do use a styling tool, be sure it never goes above 350 degrees, or a low-medium setting. Some tools can reach over 410 degrees, which is far too hot to safely style hair. LovelySkin.com carries a variety of professional-quality tools to choose from. Also, never style wet hair. This can cause a blistering effect on the cuticle and lead to even more damage. You should use a thermal protection product such as glo essentials Extreme Heat Protecting Serum whenever using hot tools. These formulas can help shield hair from damaging heat to an extent, however they should not be relied on as a long-term solution for keeping hair safe and healthy. Do you have a question for Dr. Schlessinger about hair loss and heat styling? Let us know in the comments. Dr. Joel Schlessinger answers: what is dermatitis? Occasionally, you may experience patches of dry, flaky or irritated skin without knowing what is causing it. While this irritation may be caused by certain products, ingredients or allergic reactions, it may also be a sign of a bigger issue known as dermatitis. In this post, Dr. Joel Schlessinger explains what dermatitis is and how you can deal with the symptoms. Dermatitis is a broad term that refers to skin inflammation, explains Dr. Joel Schlessinger. Dermatitis refers to skin inflammation that causes red, dry, itchy and flaky skin and can refer to a broad range of issues. Some individuals experience dermatitis that is caused by allergic reactions while others experience dermatitis caused by skin conditions. One of the most common types of this condition is atopic dermatitis or eczema. This condition causes skin to become red and itchy and in severe cases it can cause blisters. Other issues such as asthma, allergies and stress can cause eczema to worsen. Another common type of dermatitis occurs when an individual comes into contact with plants such as poison ivy. The contact causes an itchy rash that can spread and worsen as the individual continues to itch. Contact with certain fragrances, dyes and other harsh ingredients can also cause dermatitis in those with sensitive skin. Dr. Joel Schlessinger recommends FixMySkin balms to deal with dermatitis. FixMySkin Healing Body Balm Unscented contains 1% hydrocortisone, a topical steroid that helps heal the skin. This ingredient relieves itching, flaking, redness and irritation caused by conditions such as atopic dermatitis. The balm also helps soften and smooth skin on the hands, feet, body and face. You can also apply PCA SKIN Apres Peel Soothing Balm pHaze 11 (0.5 Hydrocortisone), a moisturizing cream that helps heal damaged skin. Post any questions you have for Dr. Joel Schlessinger below in the comments section. To lead a healthier lifestyle, many people are choosing to switch to a vegan diet. This diet consists of mostly fruits, vegetable and grains while avoiding meat and dairy-based foods. While it can be difficult to adjust to this lifestyle, many people who adopt a vegan diet experience health benefits, including clearer skin. Joel Schlessinger MD explains what you need to know about your skin if you are considering going vegan. Fruits and vegetable are high in essential vitamins that benefit skin, says Joel Schlessinger MD. More and more researchers are discovering that the diet has a direct effect on the skin. Those with a vegan diet have a high intake of fruits and vegetables rich in vitamins C and E, two antioxidants that fight off free radicals. These vitamins also promote healthier and brighter skin from the inside out. 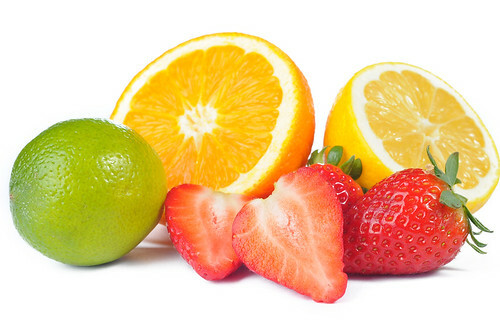 Because fruits and veggies have high water content, they help keep skin hydrated and free of toxins. Vegans also avoid dairy and cutting out milk has been shown to help alleviate some types of acne. The hormones found in milk can affect the skin and cause breakouts so when vegans cut out dairy from their diet they often see fewer blemishes. Joel Schlessinger MD explains the risks for your skin when you go vegan. A major concern of the vegan diet is the risk of deficiency in essential nutrients such as calcium, iron and zinc. Certain healthy fats such as Omega-3 fatty acids, often found in fish, are also difficult to obtain with a vegan diet. This type of fat helps keep skin healthy and radiant. If you are not replacing these nutrients with supplements, you could be harming your skin because these are all essential components of healthy complexion. Questions or comments for Joel Schlessinger MD? Ask below in the comments section. Dr. Joel Schlessinger answers: What is the Fitzpatrick Scale? While shopping for foundation, it’s not uncommon for cosmetic companies to suggest the perfect shade for your Fitzpatrick skin type. This can be confusing if you’re not familiar with the Fitzpatrick Scale. Also called Fitzpatrick skin type testing, the Fitzpatrick Scale is a classification system for skin color. The Fitzpatrick Scale is important to the skin care community, Dr. Joel Schlessinger explains. Developed by Thomas Fitzpatrick in 1975, the Fitzpatrick Scale is helpful for dermatologists and others in the skin care industry. Knowing your skin type is important because it can help you determine your risk for developing sun damage and skin cancer. The test measures genetic disposition and reaction to sun exposure to determine your skin type. Type I is very fair, type II is fair, type III is light, type IV is medium, type V is dark and type VI is very dark. You can determine your own skin type with a simple test, Dr. Joel Schlessinger says. The first part of the Fitzpatrick test considers genetic disposition. It accounts for eye color, natural hair color, natural skin color and the amount of freckles on unexposed areas of the body. The second part of the test looks at reaction to extended sun exposure. This section looks at how skin responds to the sun, how skin tans, how deep that tan is and how sensitive the face is to sun exposure. By adding up your score, you can determine your Fitzpatrick skin type as well as how to properly protect your skin from the sun. Take the test now on the Skin Cancer Foundation website. Do you have questions for Dr. Joel Schlessinger? Share with us in the comments. Often times when people begin new workout regimens, they begin to notice changes in their skin. Sweat, bacteria and germs at the gym can cause a whole new slew of problems that require a change in the skin care routine. These tips and tricks from Dr. Joel Schlessinger can help you keep your complexion as healthy as your body. Sweat can cause an increase in bacteria on the skin, explains Dr. Joel Schlessinger. Bacteria, which thrive in moist environments, are a major issue for athletes and anyone who exercises regularly. When sweat becomes trapped because of tight-knit workout clothing it can cause irritation, inflammation, breakouts and more. Dr. Joel Schlessinger recommends cleansing with CLn products that contain bleach to eliminate bacteria. For breakouts that pop up on the body including the back and chest, use a body spray such as Murad Acne Clarifying Body Spray. Antibacterial ingredients cleanse skin and salicylic helps unclog pores. To remove excess oil and bacteria from the face, use Glycolix Gly/Sal 10-2 Pads immediately after your work out. Many women make the mistake of not removing their makeup before they exercise. The combination of makeup and sweat and can cause irritation and redness. Use Dermalogica PreCleanse Wipes before you work out to remove all traces of debris. Dr. Joel Schlessinger sees many cases of athlete’s foot and other issues cause by excessive sweat. An absorbent powder such as Zeasorb Antifungal Treatment Powder for Athlete’s Foot will reduce excess moisture and bacteria to prevent issues such as athlete’s foot, jock itch and irritation. If you experience excessive sweating, try clinical-strength Hydrosal Professional Deodorant/Antiperspirant to keep you dry. Do you have skin care problems that may be related to exercise? Get answers from Dr. Joel Schlessinger.